Technical hurdles to the wide-spread use of genetic data in humans are disappearing. The cost of sequencing an entire human genome is sinking to around $1,000. Commercial companies are offering genetic tests for their clients’ personal use. Given that changes such as these are occurring, you could easily imagine that you will, one day soon, arrive at your doctor’s office carrying a thumb drive containing your entire genomic sequence. What then? Will your doctor simply download your genomic information, run a computer program, and generate a report about your chances of developing a disease or experiencing an adverse reaction to a particular medication? Unfortunately, that day is still far off. But patients are already availing themselves of genetic testing services, and bringing their test results to their doctors’ offices. The doctors, however, may be unprepared. As a practical matter, personalized medicine will be realized through intermediaries that can help clinicians work in accordance with the latest genomic knowledge. One such intermediary is the Clinical Pharmacogenetics Implementation Consortium (CPIC), an organization working to streamline the process of translating genetic test results into gene-based prescription recommendations. “The goal of the CPIC is to facilitate the process to apply pharmacogenetics to clinical practice by developing guidelines for clinicians,” states Kelly E. Caudle, Pharm.D., Ph.D., CPIC coordinator, St. Jude Children’s Research Hospital. “We do not tell clinicians if genetics testing should be ordered, but rather what to do with the information when it is available.” The CPIC strives to provide clear, concise information for providers, explaining how genetic data applies to their patients. “A genetic test is unlike a blood glucose test, which is merely a snapshot of a dynamic situation,” Dr. Caudle continues. “Genetic results follow a patient for a lifetime.” Hence, genetic information needs to be entered into a patient’s electronic health record (EHR) in a time-independent way. When a physician orders a drug for a patient 15 years after the genetic test was added, an alert needs to inform the clinician about the results of genetics testing in relation to the treatment. According to Dr. Caudle, the CPIC not only provides gene-based clinical recommendations, it also supports EHR mechanisms. Such mechanisms can, for example, facilitate the ordering of a pharmacogenomics panel in advance of clinical need (preemptive genotyping) or in response to a specific drug indication. Genetic information is revised and expanded daily. To keep up with these changes, CPIC guidelines are updated on an ongoing basis. This is essential, as what was a good review of genetic information one year, may be outdated the next. In addition to being able to add to the knowledge base of genetic information in humans, the CPIC also strives to maintain the ability to integrate with several EHR forms. Different medical groups often have different applications that they use to access EHRs. The ability of CPIC information to integrate with all EHR types is essential for information to flow freely. “One theme that has emerged is the need for standardization within pharmacogenetics,” maintains Dr. Freimuth. “How is clinical genomic data represented? We need to be able to exchange genomic information within and between systems and institutions using specific data standards. “Next, we need to define the language we use. If different words are used, the interpretation of results can become variable. We need common definitions provided by terminology standards. “Additionally, standard models are essential to describe how genomic data and clinical decisions are linked to one another. Knowledge must be captured and structured so that computers and people can read it. Genotype to interpreted phenotype tables must be standardized—these tables are really at the core to understanding and communicating information. Thus, CPIC guidelines utilize a standard format, including a standard system for grading levels of evidence, linking genotypes to phenotypes, and assigning prescribing recommendations based on these genotypes and phenotypes. Before preemptive pharmacogenetic testing can be implemented, certain elements may have to be in place. According to Dr. Scott, these elements include suitable clinical guidelines, duly informed clinicians, demonstrations of cost-effectiveness, and assurances that insurance companies will honor reimbursement plans. At Mount Sinai, Dr. Scott is participating in programs that preemptively test patients for genes involved in drug response variability. 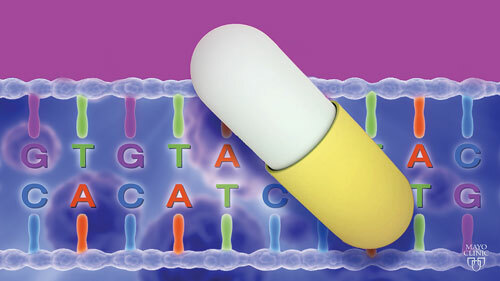 Patient-specific gene-drug information is added to the patient’s EHR, where it sits until the doctor orders a drug for which there is pertinent genetic information. Ordering such a drug essentially pulls an informational trigger—the relevant test result is retrieved and presented to the ordering physician with CPIC therapy recommendations. Certain specialties such as cardiology, psychiatry, oncology, and pain management already have well-known cases of gene-drug pairs, which were the first to be included in the implementation programs at Mount Sinai. Initially, Dr. Scott was concerned that it would be necessary to genotype 10,000 people before “triggering” would occur. However, activation of the pharmacogenetics functionality in Mount Sinai’s EHR system is occurring with only one-fifth of that number enrolled. Dr. Scott feels that doctors need education on using pharmacogenetics, as most have never had formal training before. To this end, medical students at Mount Sinai have the option of having their own personal pharmacogenetic tests performed. Later, when the students attend Dr. Scott’s lectures, the de-identified clinical results are reviewed. Dr. Scott envisions patients receiving genetic testing for a drug response panel during initial visits to the doctor’s office. This information can then follow them for the rest of their lives via their EHRs, and potentially also through smart phone apps and other personal electronic devises. To demonstrate the value of preemptive pharmacogenetics, the Mayo Clinic developed the RIGHT Protocol (short for the Right Drug, Right Dose, Right Time: Using Genomic Data to Individualize Treatment). In a study that included 1,013 participants, RIGHT was used to show that virtually every participant had a “clinically actionable” genetic variant. This result pertained to just five genes that affect drug response. International efforts to incorporate pharmacogenetics into routine medical practice can be seen in European countries. One ambitious undertaking, sponsored by the European Union (EU), is a multicenter study to evaluate the cost-benefit ratio of preemptive pharmacogenetic advice in comparison to conventional treatment considerations. This will be undertaken by the Ubiquitous Pharmacogenetics consortium. Dr. Ingelman-Sundberg concurs with the idea that it is important to keep track of the latest developments in pharmacogenetics and drug-genome interactions. The European Medicines Agency (EMA) fulfills the function of the FDA in the EU. “Employing DNA to predict a patient’s reaction to a particular drug is easier, safer, and less costly than testing for the phenotype by in vivo studies,” Dr. Ingelman-Sundberg points out. “However, we are still researching exactly what the individual’s DNA sequence means for the expression of drug-metabolizing enzymes, drug transporters, and drug targets in the patient. One interesting study focuses on determining which treatment to use for a particular cancer, especially metastatic cancer. Patients join the study, and tumor samples are obtained. From there, information on treatment response and overall survival is easily captured. Genetic information about the tumors is collected, too. “We now have the resources to do this for 6,000 patients,” articulates Dr. Sleijfer. Another study conducted in the Netherlands is a drug repurposing study for patients for whom no treatment is available. Patients who are in good condition and willing to be treated will be examined for genetic variants. From there, off-label use of medications will be considered. Cancer recognizes no geopolitical boundaries. To find new treatments and approaches, we need to consider worldwide research efforts, not only in cancer treatment, but also in pharmacogenetics. The CYP2D6 gene, depicted at the top of this image as a series of numbered black boxes (exons), codes for an enzyme that metabolizes a quarter of all prescribed drugs. Below this graphic are individual single-molecule real-time (SMRT) sequencing reads, each about 5 kilobases in length, for five unidentified patient samples. These reads, obtained via Pacific Biosciences technology, show that CYP2D6 variants are widespread. Green: adenine; orange: guanine; blue: cytosine; red: thymine. Enlarged section: heterozygous guanine/cytosine variant, with its accompanying SMRT sequencing reads. Image courtesy of Stuart A. Scott, Ph.D., and Yao Yang, Ph.D., of the Icahn School of Medicine at Mount Sinai.